For most people, when thinking about Canadian battling, Kid Twist is one of the first to come to mind. After representing his country in both Scribble Jam and the World Rap Championships, Twist was the first to hold the King of the Dot title chain, proving that in his case, looks could be quite deceiving. Despite admitting and maintaining a “nerd” image, the Toronto battle emcee utilizes a superb freestyle ability, along with his unique delivery and impressive writing, in breaking down his opponents. During the course of his battle tenure, Kid Twist has crossed paths with multiple legends in the game, including Dumbfoundead, Eurgh, 360, and The Saurus. Kid Twist is back in this years 1 on 1 Grand Prix facing 100 Bulletz, with both looking to advance one step closer to the $5000 grand prize. 100 Bulletz is a name that not as many people involved in battling know, but the Canadian battler is looking to soon change that. As an up and comer in King of the Dot, Bulletz has fought his way from the Ground Zero league to the KOTD mainstage, with win after win showing that he is not going to be ignored much longer. With arguably the hardest road in the Grand Prix so far, 100 Bulletz has had to face both Dose and Charron, and was the underdog in both matchups so far. Bringing with him an aggressive delivery and a proclivity for creative rhyme schemes, Bulletz is on a tear through this years 1 on 1 Grand Prix and has no plans to stop anytime soon. Clashing in the third round with Kid Twist, 100 Bulletz faces his toughest competition yet on his way to earning a title shot. 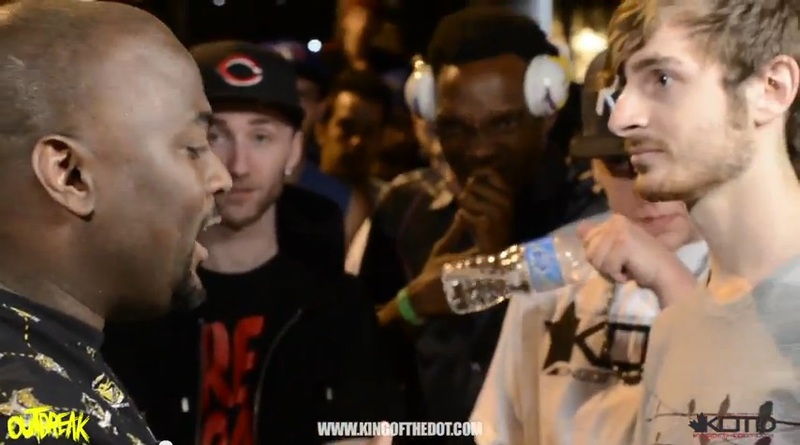 This entry was posted in 100 Bulletz, Kid Twist, King Of The Dot and tagged 100 Bulletz, Battle Rap Lyrics, Grand Prix R3, Kid Twist, king of the dot, Rap Battle Lyrics. Bookmark the permalink.